For other uses, see St. Nicholas' Cathedral (disambiguation). The Cathedral of Our Lady Immaculate (in French language: Cathédrale de Notre-Dame-Immaculée), but sometimes called Saint Nicholas Cathedral (name of the old church which was demolished in 1874), Monaco Cathedral (French: Cathédrale de Monaco), is the cathedral of the Roman Catholic Archdiocese of Monaco in Monaco-Ville, Monaco, where many of the Grimaldis were buried, including Grace Kelly and—more recently—Rainier III. 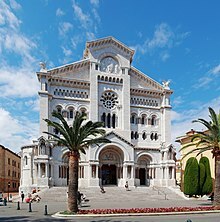 The cathedral was built in 1875–1903 and consecrated in 1911, and is on the site of the first parish church in Monaco built in 1252 and dedicated to Saint Nicholas. 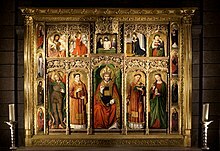 Of note are the retable (circa 1500) to the right of the transept, the Great Altar and the Episcopal throne in white Carrara marble. Pontifical services take place on the major religious festivals, such as the Feast of Sainte Dévote (27 January) and the national holiday (19 November). On feast days and during religious music concerts, one can hear the magnificent four-keyboard organ, inaugurated in 1976. From September through June, “Les Petits Chanteurs de Monaco” and the singers of the Cathedral Choir School sing during Mass every Sunday at 10:00am. Mass is also celebrated here each year on 6 December, when primary children gather for a joyful remembrance of St. Nicholas' life. Wikimedia Commons has media related to Cathedral of Our Lady Immaculate, Monaco. This article on a Roman Catholic cathedral in Europe is a stub. You can help Wikipedia by expanding it. This article about a church building or other Christian place of worship in Monaco is a stub. You can help Wikipedia by expanding it.